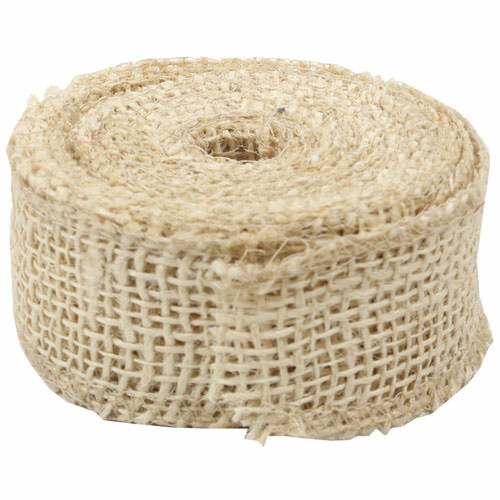 Wrapping your gift, decorating your Christmas ornaments, or adding on to a beautiful wedding centerpiece can all be done with our Ivory Burlap Ribbon. With the elegance of the ivory color and the rustic look of the burlap ribbon, you are sure to have the perfect accessory to tie up in a gorgeous bow. The woven look and natural texture also makes your ribbon stand out from the rest. The best feature about this ribbon is the ivory color since it can be used for any item. Christmas, weddings, Easter, birthdays - whatever holiday or event you want, this burlap ribbon will give. Make sure you grab a spool of burlap and never have to look for another gift wrap! Burlap Ribbon measures at a width of 1 1/2 in. and a length of 10 yd. Loving the burlap ribbon and want even more colors? Look under 'Other JAM'n Products You Might Like' for an assortment of shades to choose from!